Warren S. Sandberg, MD, Ph.D.
Dr. Sandberg is chair of the Department of Anesthesiology at Vanderbilt University School of Medicine and professor of anesthesiology, surgery, and biomedical informatics. Dr. Sandberg received his Ph.D. in biochemistry and molecular biology from the University of Chicago, and his M.D. from the University of Chicago, Pritzker School of Medicine. He served his internship at the University of Chicago Hospitals and was a resident/fellow in the Department of Anesthesia/ Critical Care at Massachusetts General Hospital. Dr. Sandberg joined the Harvard faculty in 1998 where he served until his selection as chair at Vanderbilt, April 2010. At Vanderbilt, Dr. Sandberg divides his time between clinical practice, research and administration. 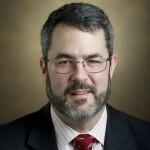 He has a clinical and research interest in the development and use of informatics in anesthesiology, and Vanderbilt is a recognized national leader in informatics, quality and health outcomes research. Dr. Sandberg’s specific research interests include: factors affecting physician-patient communication, patient care technology, perioperative systems design and OR workflow management. In his role as Chair of the Department of Anesthesiology, his goal is to leverage forward thinking technologists and the already present capabilities of the institution to develop a world class anesthesia informatics and real time decision support research program.